Prior to turning 50 I actively worked to reduce my cholesterol levels by reducing my animal fat intake and generally following a modern "Heart Healthy" diet as promoted by medical authorities including the Heart Foundation. In hindsight, this was a bad move: My cholesterol levels continued to rise, I started having to get up in the middle of the night to pee, my running became laboured and painful and I was increasingly depressed about my work! I suffered cold hands and feet even in summer. Most disturbing of all; I was getting skin cancers all over the place. The last couple of years have seen a dramatic reversal of this pathetic and disturbing decline which I depressingly assumed was signaling the onset of old age! I switched back to animal fats, including full fat dairy, eggs and meat. For the last year or so we have been drinking raw full fat milk (predominantly Type A-2). The last four years has seen a steady and delightful improvement in my health. My cholesterol levels have dropped a little for the first time in 20 years. Astonishing! My skin cancers have all disappeared, I no longer get up to pee in the middle of the night. I am running and cycling as fast and as long as I did 20 years ago. Oh - and libido is cranking along on all 8 cylinders! 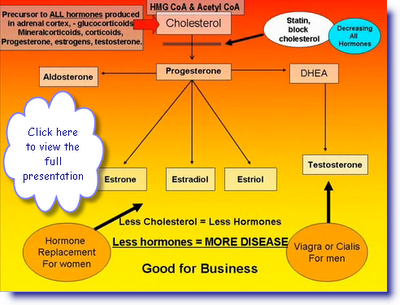 For a good rundown about the biochemistry of cholesterol and its role in the body for the production of hormones like estrogen and testosterone and also how to combat inflammation, please click on the presentation in the upper left of this article. You may need to pause the presentation in places to read the slides properly. When reading these slides, please bear in mind that I am not advocating a high meat diet like the Atkins Diet or anything near that. while we eat a wide variety of meat, fish, eggs and dairy these are not in excess by any measures. Our family diet is rich in vegetables nuts, berries and fruit. Grains tend to be whole and little sugar is consumed other than that found in juices and honey. The most important point to take from this presentation is the importance of adequate cholesterol for health, including the production of hormones that drive the body's processes. In my opinion a total cholesterol level of between 4-5.5 4 mmol/L is just fine. Higher or lower and health may be at risk. If your levels are creeping up despite a low cholesterol diet, the reason may be partly due to lack of sunshine on your body! UVB radiation convert cholesterol into cholecalciferol. And cholecalciferol (vitamin d) combines with LDL cholesterol to form steroidal hormones. Gun this process up and cholesterol is put to good use! saturated fat is your friend as well consumed the same way, coconut oil is loaded with the best saturated fat you will get. watch for foods also containing hydrogenated and trans fats, both bad fats, get the fat as unprocessed as you can. if you eat a balanced diet with fresh fruit and vegesa and take antioxidants you won't get the "bad cholesterol" which is really a misnomer, the LDL cholesterol has a tendancy to cause problems when taken in excess on a poor diet without enough antioxidants its not bad cholesterol at all, its just most people have far too much of it and over time it can cause problems because of these reasons.